Muslims will be the majority in Nigeria in the next 20 years, according to a study by the Pew Research Centre. The population is set to more than double, to 117 million, by 2030. This will mean that Nigeria will become a predominantly muslim country, with 51.5% of Nigerians being of the muslim faith. In a country that has religious tension between christians and muslims (especially in certain parts of the country) I wonder what this ‘takeover’ will mean for peace and stability in the future. Nigeria is roughly divided, in terms of religion, as a muslim north and christian south – with the centre of the country being a mix of the two faiths. 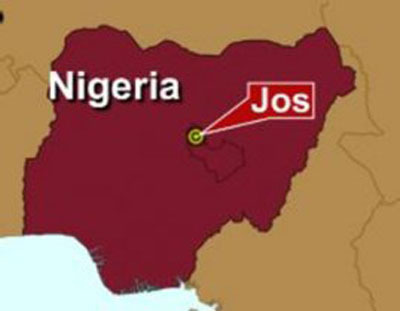 Jos, is located in the central part of Nigeria. The region has rarely been out of Nigerian and African news recently because of the (suggested) religious motivated clashes. 2010 and this year have been a particularly bad time for the city which has become synonymous with violence. Blame for this has been thrown both ways. People are quick to blame to muslims in the most general of ways. Understandably, perhaps, as most of the people killed in last year’s riots were Christian. But looking underneath the surface of religion, it’s quite clear to see that the typical causes for unrest have more to do with these clashes. A worrying aspect of the data collated by Pew Research is the high number of illiterate muslim Nigerian women. “According to a Pew Forum analysis of the 2008 Nigerian Demographic and Health Survey, the percentage of women of childbearing age who cannot read is three times as high among Muslims (71.9%) as among non-Muslim Nigerians (23.9%). It’s imperative to think about how this vast inequality between the people of the two main religions have an effect on the turbulent nature of central Nigeria, where the two groups mix and interact the most. The ‘takeover’ of the muslims in Nigeria is by a slight majority, and in itself should not cause any alarm. The percentage divide will still be roughly equal. What must be fixed, however, is the education and prosperity levels between the two groups. Economic deprivation in one group leads to frustration and resentment, which in turn leads to instability and in Nigeria’s case, violence. The government of Nigeria need to turn their focus on not only punishing tose responsible for the clashes, but also to solving these underlying problems. 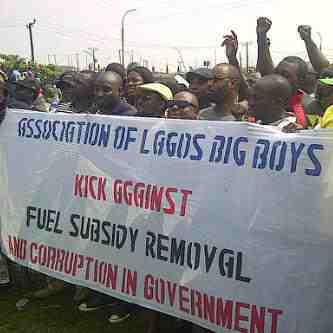 The protests have all but stopped in Lagos. And reports of protests dying down in the rest of the country have divided the public. Some are happy to return to normality, but many in the country are bitterly unhappy with the compromise the labour unions have made with the government. The removal of the oil subsidy, on January 1, made oil prices more than double at the petrol stations from 0.40$ to 0.90$ per litre. A side-effect of this was a hike in the cost of food and public transport. On Monday, Jonathan partially reversed the removal, cutting the prices from 0.90$ to o.60$ per litre. And in return, the key labour unions -the Nigeria Labour Congress (NLC) and the Trade Union Congress (TUC) – called for an end to the strike. Unfortunately, the inflated prices of food and transport have not fallen in line with the petrol concession. The consequence for most of the country, already living on the breadline, will be a deeper fall into poverty. For many who sought a return to the original pre-2012 price of 0.40$ per litre, the cut is not deep enough. NLC President Abdulwahed Omar, and TUC President Peter Esele, have been accused of receiving bribes from the government, although there has been no evidence to back up these claims. As the country tries to get back on its feet after a week-long standstill, people are still asking questions like these. People are asking why the government spends so much on government officials’ salaries and expenses. Many are wondering why the refineries are not being brought up to standard; and some would like to ask why the subsidy removal was not implemented gradually, over a defined period of time. Why the rush? One thing’s for sure – the protest made some impact. It may have not been the victory that some were hoping for, but it did send a clear message to the rulers and the elite. With the dubbed ‘year of the protester’ just behind us, a growing population savvy with social media, and possessing an increasing political consciousness, the message seems to be that there are certain lines not to be crossed. The federal government has once again teamed up with an enemy of the Nigerian state – the IMF – by calling for one of the most controversial bills of the last decade. Our bright sparks in office are planning to remove the oil subsidy that keeps the oil (that we produce) at a reasonable price when we buy it back – refined and ready for use. Why do we need to buy our own oil? Because we have 4 oil refineries that barely work, due to a lack of maintenance and sabotage by militant groups. These problems could have been overcome by an injection of revenue from the government. But buying back the oil from abroad has worked out in favour of profit-skimming officials. This policy change has upset a lot of people. For many it feels like another blow to the head in an unfair boxing match of The Elite v The proletariat (normal folk). 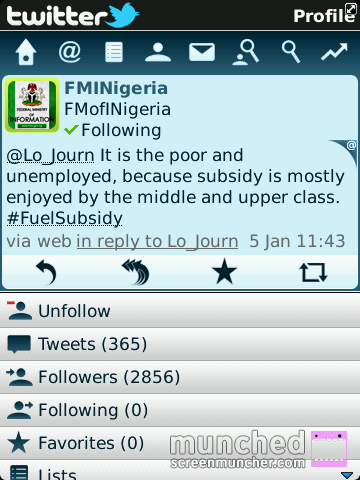 But if this must go ahead then there could be some benefits to saving money from the subsidy. How much money is to be saved? Approx 1.5 trillion naira per annum (9.4 billion dollars). The money saved from the deregulation of oil could be used to implement and actually SEE-THROUGH effective structural programmes to help improve poverty across the country. This is fair, as the very poor can’t afford to enjoy the benefits of petrol, even at the subsidised prices. If the government have good intentions with this deregulation, it could change countless lives in a country where 60% live below the poverty line. The extra money could also be used to build new, efficient, refineries which the country is seriously in need of. 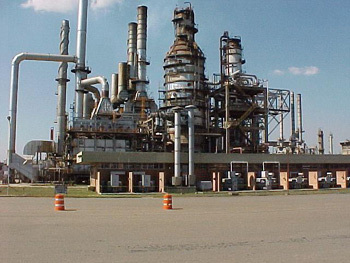 The four refineries that exist today are creaking along and working at less than full capacity. The money saved on the charges accrued from shipping the oil to foreign refineries, paying for the production and then buying back the refined oil from oil giants would save the economy a vast amount of money. Here were the results (NB the exploration, development and operations costs have been combined in the first figure of ‘0.04’). The total cost can then be determined as the summation of all relevant cost components previously estimated viz., Exploration, Development, Production Operations, Refining, Distribution and Marketing. Total Cost = (0.04 + 0.11 + 0.02 + 0.04) USD/Litre. Therefore, we can conclude that the Average cost of the Petrol dispensed at retail Fuel Stations in Nigeria is, 0.21USD/Litre. Given that the cost of petrol at the station for Nigerians is 0.41USD/Litre, you can understand why some question the existence of an oil subsidy at all, but the government would argue that the extra cost comes from the exported oil rather the home-refined. The point is that refining all of the oil within the country makes economic sense. This could spillover into social benefits too, like job creation. If money meant for projects like new refineries were being appropriately allocated, and if corruption wasn’t as rife, then this could all be done without removing the subsidy. But, if they must, then clear, transparent plans on using this extra money on long-term investments like refineries should be provided for the public. What is most likely to happen though? Petrol prices rocket and no major changes are seen in terms of improved education, healthcare or infrastructure. People will find themselves with less money to spend on other necessities and as for the IMF – well they can sit easy knowing that some parts of the developing world are still well and truly under their thumb. 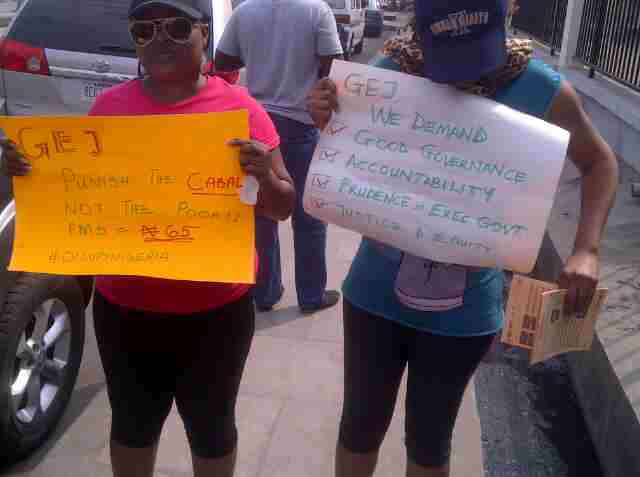 Also read:- Which came first – the corrupt citizen or the corrupt government? Islamic extremism in Nigeria – are we concerned? Well yes. According to pewresearch.org a whopping 76% Nigerians are worried about national Islamic extremism. When one thinks of Islamic extremism in an international context, Nigeria is not one of the first countries that comes to mind. But with roughly half the nation’s population being muslim, it’s not absurd to postulate that there may be some problems with extremism within the country. First, let’s examine this term that gets thrown about so often – what does Islamic extremism actually mean? 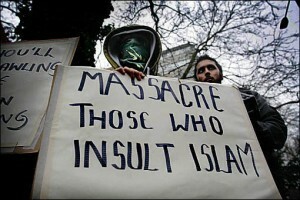 Islamic extremism is, in essence, aggressive ideology in which violence is often used to solve the perceived problem. Suicide, bombings and assassinations are tactics often used by this small section of the Muslim religion. Extremists have long been berated for giving Islam a bad name and there are many muslims who do believe in a peaceful coexistence with members of other religious faiths. One aspect of Islam that strikes fear into many is Sharia Law. Yes the law that advocates stoning a woman to death if she has been found cheating. By 2009, 9 states in Nigeria had instituted Sharia Law, and 3 more states have implemented Sharia law in areas where there is a high muslim population. Scary stuff eh? Well, I guess I should also explain what Sharia Law is all about, in a neutral, non-scaremongering way. Sharia Law, is according to muslims, a combination of the principles set in the Quran and the sayings and living habits of Prophet Muhammad. Contrary to popular belief, Sharia Law has many peaceful aspects. Sharia Law dictates that Muslims must pray 5 times a day, go on a pilgrimage to Mecca, fast and even pay an annual tax to the poor of their countries. Then there are the more shocking laws such as amputation of the hands as punishment of thievery and yes, the stoning of an adulterer – although this should apparently apply to both sexes and not just the woman. The problem with Sharia Law and elements of Islamic extremism is that ideas are open to interpretation and perversion – and in most interpretations the punishments are extreme and women fare the worst. Jihad is another Islamic term the world has become all too familiar with in the 21st century. Jihad is an Arabic word that can be translated in many ways including ‘struggle’, ‘to strive’ or ‘to fight’ – it all depends on the context. It also means spiritual self-discipline but many of us know it as a holy war on behalf of Islam. 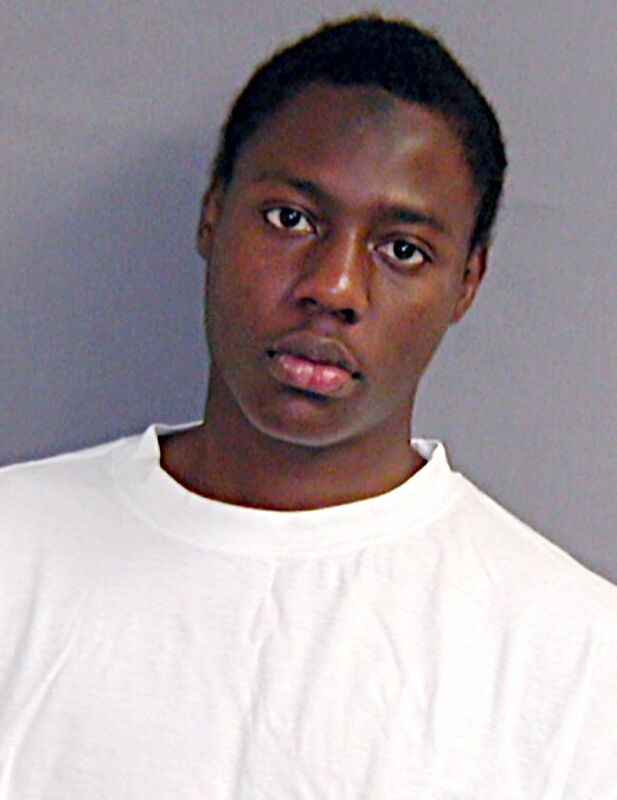 In 2009, a 23 yr old Nigerian muslim, Umar Farouk Abdulmutallab, attempted to detonate explosives hidden in his underwear as the plane descended in to the USA. Many Nigerians shrugged this off as a unique event and it was argued that he was radicalised outside of Nigeria. 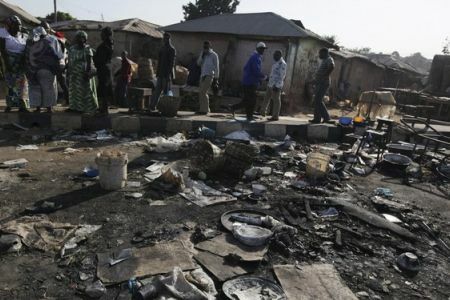 Jos, in the center of Nigeria, experiences frequent clashes between the Muslims and Christians that reside in the city – and this is usually violence against Christians. However, I have discussed in another post how the violence in Jos should not be merely looked at from a religious perspective. A public workshop hosted by the U.S. Institute of Peace explored whether Nigeria is becoming ‘a hot-bed of Islamic terrorism’. John Paden, an international studies professor claimed that the country is certainly not. Instead he said: “If anything, Nigeria is a hotbed of Islamic moderation”. Interesting turn of phrase, but what does this actually mean? Well Paden goes on to argue that “Islam has a long history in Nigeria and has largely maintained a decidedly “West African” character, and less dependent on outside influences from the Arab world.” I agree. My father is a Nigerian and Muslim. And I would have to describe him as a moderate muslim – one who lives in harmony with a Christian wife. He seems to separate his religion from his national identity and culture. but Islam and culture are bound and tied together in many parts of the Arab world. Let’s take the clothing of Muslim women as an example. The Quran does not instruct women to wear the burqa. 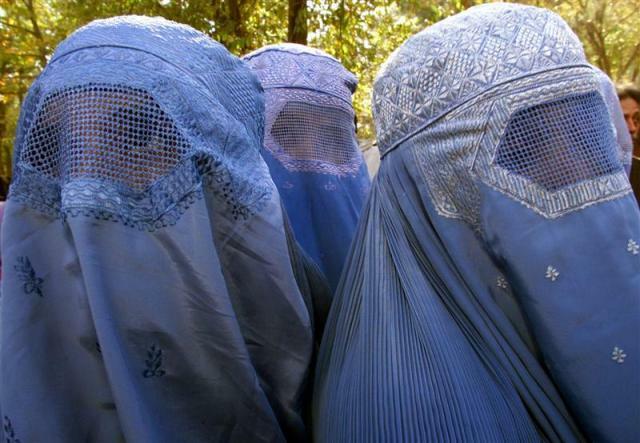 However some Islamic cultures like that of the Taliban, insist on women wearing this attire. More ‘moderate’ Islamic cultures such as those in Turkey do not insist on women completely covering themselves up. It is a rare sighting to see a muslim woman in Nigeria wearing the full Burqa too. To conclude I’d say that Nigeria doesn’t need to be on high alert of Islamic extremism at this point in time. But one thing I would throw out there is that if certain Islamic groups were to focus on turning Nigeria into a ‘hotbed of Islamic terrorism’ it certainly wouldn’t be that hard. The lack of strict rule of law and rife corruption will make it fairly easy for these groups to set up camp in the country if they learn how to play the Nigerian game of back-handers and turning a blind-eye. So in that case, we can all breathe a sigh of relief – but at the same time we’d do well to keep one eye open. The past few governments have truly had their work cut out for them, after all, swindling the country’s money is hard-work and time-consuming. So much so that they haven’t had the time to pay attention to industries other than oil, or run a general election without it becoming an absolute joke. With the elections that were meant to take place last Saturday being postponed for a whole week, the world has been reminded of what a corrupt country Nigeria is. Not only does the whole registration/election process highlight severe corruption, it also highlights the disorganisation that Nigeria seems cursed with in all political and social affairs. It’s easy to blame the people sitting in power. Of course they are certainly the ones making immoral and moronic decisions that impact negatively on the people they are meant to serve. The government should be responsible for infrastructure, education, nourishing and protecting home industries and making sure international trade is as beneficial as can be. But Goodluck Jonathan, Namadi Sambo, and those under and around them did not arrive on a spaceship from planet Corruption. They are, after all, former ordinary citizens. “Corruption is perceived as pervasive. Nigeria ranks 130th out of 180 countries in Transparency International’s Corruption Perceptions Index for 2009, a drop from 2008. Corruption is endemic at all levels of government and society, and the president, vice president, governors, and deputy governors are constitutionally immune from civil and criminal prosecution. Domestic and foreign observers” recognize corruption as a serious obstacle to economic growth and poverty reduction. In Nigeria, it’s normal to play ‘the game’. From bribing airport staff when one enters the country to paying 20N to policemen at so-called ‘checkpoints’ dotted along the main roads to allow you to get on with your journey. Travelling to my father’s house in Ibadan from abroad we were stopped by policemen, armed with guns, who demanded a search of our car. In the glove compartment was a sum of money given to my father, by friends, to pass on to their relatives. Of course the policemen demanded a large portion of that money. Money that had entered the country legally and money that was not theirs to take. After much pleading, they finally accepted a smaller proportion of the money and went on their way. Corruption, like any virus, has spread throughout all sectors of society. From politics, to education, from the top to the bottom. No one seems to be immune. 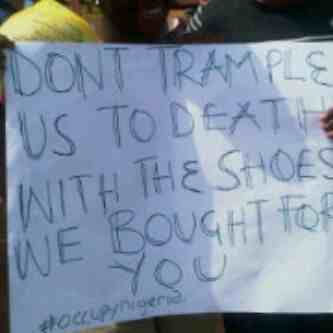 But Nigeria is going to need some sort of cure – some sort of revolutionary change in mindset to change the status-quo. It’s easy to blame ‘them’ but what ‘you’? Just a quick post to share this article, written by Bim Adewunmi. The piece was recently published in the British newspaper site, The Guardian, following a poll citing Nigeria as the ‘happiest’ country in the world. There is nothing for me to add apart from saying that I am not at all surprised with the findings. After multiple extended visits to Nigeria, I could tell Nigerians are people full of hope and an inner happiness called ‘joy’. Something those of us in the west could learn from. Read the article here.